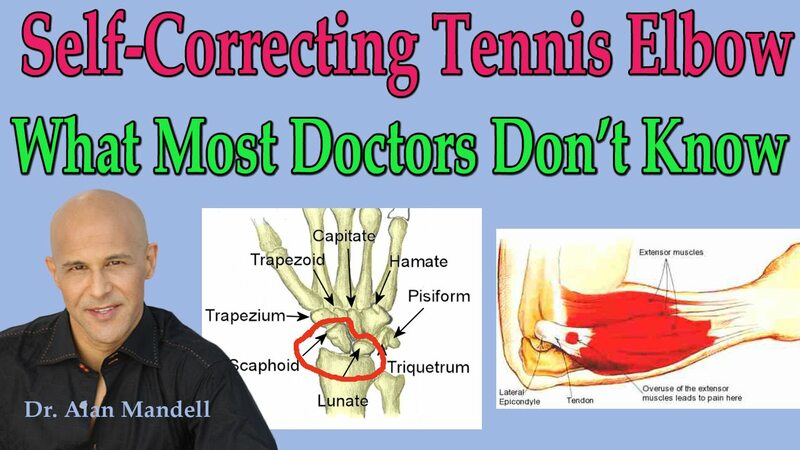 Dr. Mandell demonstrates the functions of the wrist flexors and extensors and explains part of the dynamic of how cumulative stresses cause Tennis Elbow and Golfer’s Elbow injuries. See this video for a closer, more detailed look at the anatomy involved. Dr. Mandell then demonstrates a very simple technique that anyone can use for mobilizing and self correcting those carpal joint fixations. Although, Dr. Mandell is the Chiropractor and the expert on fixated joints and how to mobilize them, I would not expect to see any lasting relief from this technique by itself. But I can’t see how these issues can be truly resolved without a lot of soft tissue release of the adhesions in the Wrist Flexors and Extensors involved to normalize them and correct the abnormal patterns of tension that are “locking up” those carpal joints. Nevertheless, I think this technique could very well be a good addition to an overall, comprehensive Tennis / Golfer’s Elbow treatment plan.